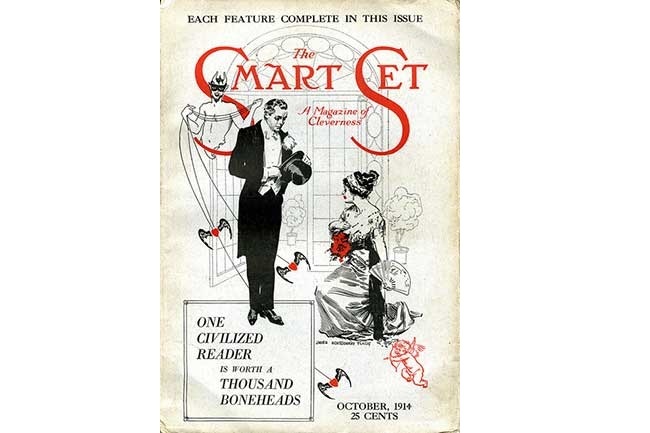 “One Civilized Reader Is Worth a Thousand Boneheads”: the October 1914 cover of The Smart Set—the second issue edited by George Jean Nathan and H. L. Mencken. Image courtesy of the Flickr account of Johns Hopkins Rare Books, Manuscripts, & Archives. In August 1914 H. L. Mencken and George Jean Nathan became the editors of the magazine The Smart Set, which had been founded at the turn of the century and was experiencing a slump in readership and advertising. The first issue under their management, published in September, retained the subtitle “A Magazine of Cleverness,” but the October issue added on its front cover, “One Civilized Reader Is Worth a Thousand Boneheads” and the November number promised readers “a moderately intelligent and awfully good time.” Subsequent issues continued the whimsical nature of its editorial trappings. During the next decade, a typical issue of The Smart Set contained up to two dozen short stories, a dozen poems, and one play, along with a scattering of articles and reviews. 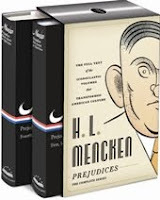 Mencken and Nathan became famous for discovering, fostering, and reviewing new writers, including the likes of James Branch Cabell, Willa Cather, Edgar Lee Masters, Edna St. Vincent Millay, and Eugene O’Neill (whose first published play appeared in its pages). The May 1915 issue introduced American readers to James Joyce with two stories from Dubliners. Several years later much of F. Scott Fitzgerald’s early fiction, including his first story in a national periodical, was featured by The Smart Set. The magazine also presented now-forgotten authors who were well known in their day, such as the bestselling Arkansas native Thyra Samter Winslow and the pulp-fiction writer Vincent Starrett. After the book herein discussed came out I heard nothing more from the author until 1935, when he wrote to me from Wisconsin and then from Chicago. It appeared that he had married, had nine children, and was out of work, and that the whole family was trying to live on a dole of $17.28 a week. He said that he had written another book . . . , but I never heard any more about it. Notes: On page 135, Mensch-an-sich means “the man himself.” On the same page, Mencken mentions two of Robert Steele’s literary antecedents. Giovanni Jacopo Casanova de Seingalt (1725–1798; better known simply as Casanova) surely needs no introduction. Benvenuto Cellini (1500–1571) is the Italian Renaissance artist most remembered for writing a colorful and racy autobiography. Update: A number of readers have asked if One Man is available today. A facsimile edition is available as a print-on-demand title through Amazon, or you can download it online at the Internet Archive.